Today’s guest post comes from my good friend and fellow coach, Jennifer Vogelgesang Blake (JVB). 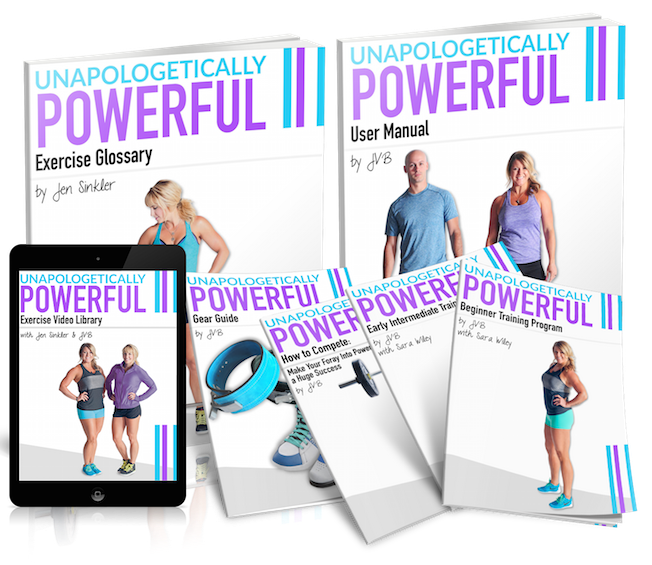 One of the smartest, kindest, and strongest people I know, JVB wrote this phenomenal piece that coincides with launch of her new program, Unapologetically Powerful which is on sale at a low introductory price through this Friday. You can learn more about JVB’s Unapologetically Powerful program HERE. I’ve got a proposition for you: let’s make 2016 the Year of The Bench Press. That’s right, big squats and deadlifts have had their time in the sun (and rightly so, because hello, big plates and thick, shapely thighs and buns!) but now it’s time for them to share the spotlight with a lift that will help round out total-body strength and add even more aesthetically pleasing muscle. Upper-body strength is important and for many women, it’s lacking. We naturally have less muscle mass up top than men and I’ll agree with what trainer Alexander Juan Antonio Cortes says in a recent article for eliteFTS: “Women [lifters] are building three plate lower bodies and one plate upper bodies.” I think he’s got a point. Training our legs and glutes is really fun—the muscles are bigger so we can move bigger weights more easily on the quest for a booty so big it requires its own zip code. The other day at Movement Minneapolis, a brand-new gym member told me her primary goal was to get stronger, but that she also wanted to see what she called “coconut shoulders” in the mirror. I can’t help but chuckle at the visual, and feel encouraged that women, even new lifters, are more open to muscular upper bodies than before. The bench press is a competition lift for powerlifters. It’s a compound movement that recruits your pecs, anterior delts, triceps, lats, and traps, and even your glutes and core. Because all of those muscles are called into play, getting great at bench means you get to move some pretty serious weight. Of course, you don’t have to be a powerlifter to embrace the bench press. You can embrace this lift simply because it offers such big bang for your buck in terms of strength gains. And the coconut shoulders are a nice perk, too. Now that I’ve talked you into the Year of the Bench Press, here’s how you’re going to build those muscles by getting your bench press form on lock. Check out the following three tips to nail it down, plus my two favorite accessory lifts to build a stronger upper body and a bigger bench. The bench press is an upper-body movement that actually requires whole-body participation to get the job done well, and much of what your success relies on happens before you even touch the bar. When you set up for the bench press, draw the shoulder blades down and pull your feet behind your knees to arch your spine and squeeze your glutes. It’s going to feel tight, but it’s necessary to move the most weight possible for you. Pressing the bar off the chest is only part of lift execution—what you do on the way down is just as important as what you do on the way up. Think about actively pulling the bar down to your chest and raising your chest up to meet the bar. This will give you more control over the bar path and help you stay tight from start to finish. In a powerlifting meet, the bar must become motionless for a brief moment on the lifter’s chest for the bench press attempt to count, so it’s important to include that pause in training. Practicing without it could lead to an unpleasant result on meet day. All lifters benefit this type of full-range-of-motion rep. Bringing the bar all the way down to touch the chest before pressing the bar up will maximally hit the chest and shoulder muscles, building true strength in the movement. Now that we’ve covered bench press technique, let’s talk about how you can use supporting lifts to increase your bench press numbers and improve your upper-body strength. Do these two exercises after you bench. Pause pushups are a fantastic exercise to target upper-body strength and an excellent pairing for the bench press: They hit the same muscles and they also train that oh-so-important pause. Think of pause pushups like a bench press flipped face-down and you’re pressing the floor away instead of a bar. Minus the arch, of course, because another bonus to performing pushups is the added benefit of building core strength; brace the abs like you’re about to get sucker-punched and squeeze your glutes so to prevent your hips from sagging towards the floor. Perform 2 to 3 sets of AMRAP (As Many Reps As Pretty) following the bench press, and if you’re not yet doing full range of motion pause pushups with your hands on the floor, elevate your hands on a bench or a box. I love the chest-supported row as a supporting movement for the bench press because it’s a heavy hitter for the muscles of the upper back (which you remember play a key role in the descent portion of the lift), and it uses a pull instead of a push to strengthen muscles used in the bench press, which is a nice way to offset all the pressing you’re going to be doing. Perform 2 to 3 sets of 8 to 10 reps after the bench press, choosing a weight that’s challenging but doable for full-range-of-motion reps. Check out the vid below before you get going…I mean rowing. Jennifer Vogelgesang Blake’s leggings might be pink but her weights aren’t. 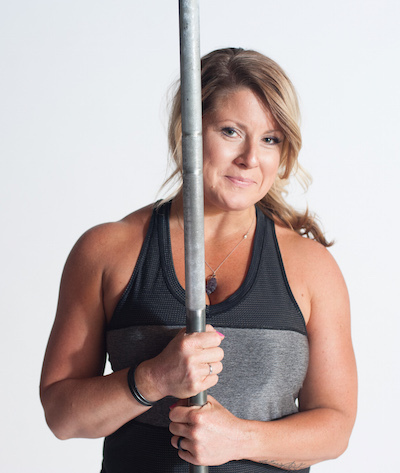 A personal trainer at The Movement Minneapolis she is a powerlifting coach and competitor with a passion for helping her clients discover and grow their strength, inside and out. She’s here to spread the good word that strong is empowering and because of that, really, really fun.